See our latest personalized stickers for Hershey's Kisses, envelope seals, lollipops and favor tins. Our stickers are a great way to add a personal touch to your party. 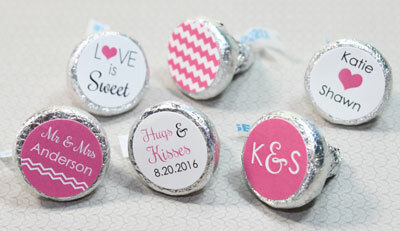 Whether you want to add them to Hershey's Kisses, invitation envelopes or to create memorable lollipops, Candy Wrapper Store can match your party colors or theme and help you create truly unique favors for your celebration.